It's my last Hope Quest mineral pigment reveal and it's the smallest reveal yet. When asked what my favorite colour is, 'blue' is usually my reply. 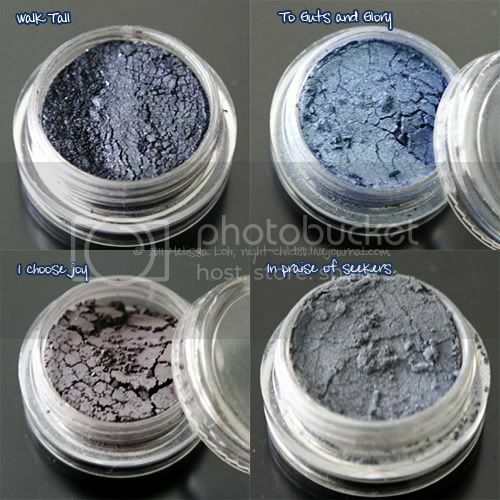 Yet blues are not my colour of choice when it comes to eyeshadows. Perhaps it's because of the make-up book I read back in the 80s that dictated that only women with blue eyes should wear blue eyeshadows (amazing how far we've come in the world of colour since then). Or Mimi from the Drew Carey Show has permanently scarred me for life against blue eyeshadow. But hey, it's a new year and I gotta live a little. 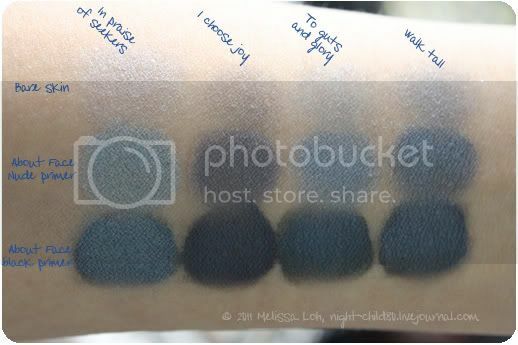 A few blues in the arsenal wouldn't hurt and I can definitely incorporate the darker blues into the smoky eyes I tend to favour. Seeing as this is the last Hope Quest reveal, I'm sorry I won't be able to purchase any more mineral pigments from Heather. She has developed some gorgeous colours with such pretty twinkle and glitter any girl would go ga-ga over at such reasonable prices. Wherever and whatever she plans to do in the future, I can only wish her the best and thanks for an amazing colour-filled ride. This page was loaded Apr 22nd 2019, 2:48 am GMT.